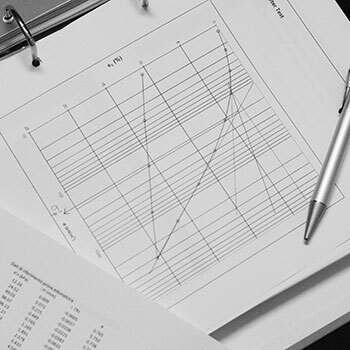 On using numerical analysis for geotechnical engineering problems, the suitable choice of soil constitutive model plays a crucial role in determining the reliability of the results. Moreover, a correct identification of the parameters of the chosen model is another vital issue. WeSI Geotecnica offers a high-quality identification of soil parameters making use of advanced optimization techniques being used and calibrated by specialists of numerical analysis. Since the late '60s many advanced constitutive laws have been developed and implemented in finite element codes mainly by academics. Nowadays, after decades of testing and validation against measured data, many of those advanced constitutive models are available for beign exploited for engineering practice, and WeSI Geotecnica assists its clients in doing just that. Models currently available for direct application are Cam Clay-like models, double hardening models and models that take small-strain stiffness into account, amongst others. Finite element analysis that accounts for large deformation is also available, thus including second order effects, such as the stiffening contribution of deformed geosynthetics or the moment induced by tilting structural elements. Conventional geotechnics tends to restrict the analysis to primary consolidation, thus referring to the dissipation of excess pore pressures and the consequent load transfer from water to soil skeleton. Practicioners dealing with construction on soft soils are well aware that accurate design should include time-dependent mechanical behaviour of newly deposited or lightly overconsolidated clays. Viscous effects (creep) in soft soils can be taken into account by using the constitutive models available in commercial codes or developed in house by the specialists of WeSI Geotecnica.